This ready-to-use workshop is organized as a series of modules, gathered on a webpage. It is intended to meet the needs of service providers who are working with parents experiencing mental health challenges. It was developed specifically for those working in the Healthy Babies Healthy Children program, but is useful for any service provider or professional working with pregnant women or parents of young children, who may be experiencing mental health challenges. 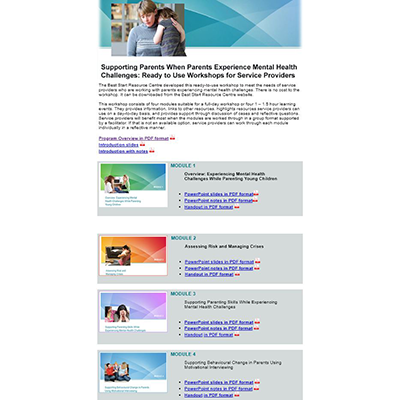 Information on mental health challenges and their impact on parenting. Strategies to assist clients experiencing a crisis. Strategies to engage and support clients to assist them to develop and/or maintain positive parenting skills despite their mental health challenges. Strategies to assist clients with behavioural change and goal setting. Links to additional resources for education and support.